Background: Suicide is the second leading causes of death among 15- to 19-years old.The onset of adverse life events represent important proximal risk factors for suicidal beahviors.The objectives of this study are to determine the patterns. Methods and Findings: This study used a case-control design in which a sample of 136 adolescents who had attempted suicide was contrasted with 658 community controls. The measures included sociodemographic factors; the Adolescent Life Change Event Scale (ALCES), which is a self-administered questionnaire that explores the onset of stressful life events; and the State Worry Questionnaire (SWQ), which measures the level of worries across five distinct domains. According to the results of multiple logistic regressions, adolescents who had attempted suicide reported elevated rates of both stressful life events and worries. Multiple logistic regression analysis showed that adolescents who had attempted suicide were more likely to have experienced three categories of life events were more specifically associated with suicidal attempt: (1) stressful life events related to one’s family characteristics (parental divorce/separation); (2) the disruption of an affective relationship (e.g., a romantic break-up or the death of a close friend); or (3) legal or disciplinary problems (e.g., school disciplinary problems or expulsion). These life events were associated with a definite increase in the total SWQ score, specifically on the SWQ “aimless future” subscale. Conclusions: This data indirectly confirms that a surge in adolescents’s level of worry is one of the mechanism by which a stressful life event could precipitate suicidal behaviors. However, particular attention should be paid to the assessment of suicidality in context of disruptive disorders in adolescents, as the social consequences of these symptoms represent an important risk for suicidal behaviors, and moreover, irrespective of the level of worry. Suicide is the second leading cause of death among 15- to 19-year-olds . Approximately 5% to 8% of adolescents have already attempted suicide in the US, and a comparable prevalence has been reported in Europe . France is among the countries with the highest rate of suicide (14.7 per 100,000), far exceeding the European average (10.2 per 100,000 population) . Suicide comprises 16% of all deaths among 15- to 24-year-olds . Adverse life events are robust predictors of suicidal attempts among youths [5-7], even after adjusting for known risk factors such as psychopathology, a family history of suicide attempts, social background, familial context, and temperamental factors [5,8,9]. From a prevention perspective, a distinction is made between the proximal risk factors that precipitate a suicide attempt and the distal risk factors that predispose individuals to suicide attempts [7,10]. Compared with early adverse childhood experiences, far less attention is paid to the effect and the nature of recent negative life events that might precipitate suicide attempts. The majority of the data available on the relationship between recent life events and suicide attempt initially came from studies based on psychological autopsies. For example, Cooper, et al. investigated the period that preceded suicide among 84 adults <35 years of age. Suicide was associated with stressful life events over the last 3 months and, in particular, over the last week. Two specific types of stressful life events were most commonly found: severe interpersonal conflicts and forensic life events (e.g., being arrested, charged or sentenced). However, the level of evidence that these studies provide is necessarily limited by methodological issues. On the one hand, no specific measure of individual level of distress is associated with exposure to stressful life events because the information obtained is based on indirect reports. On the other hand, the information collected from bereaved relatives is likely particularly prone to recall biases (also known as “effort after meaning”). In adolescents, epidemiological studies have been conducted to determine the effect of recent life events on the risk of suicide attempts [7,12,13]. Given the low prevalence of suicide in the general population and the necessity of testing various types of exposure, the majority of these studies used a case-control design. In addition to other individual and environmental risks factors, hopelessness is considered as an independent proximal risk factor for attempting suicide [10,14]. Thus, a feeling of hopelessness and concerns about the future are frequently described the day preceding the act among adolescents who attempt suicide. However, it is unclear whether these feelings of hopelessness and the onset of recent stressful life events are independent. Several authors have suggested that hopelessness affects the risk of attempting suicide regardless of the presence of stressful life events . In contrast and consistent with the cumulative model of risk factors for suicide attempts, negative life events likely produce enhanced states of burdensomeness and decreased belongingness, thereby contributing to suicidal attempts through an increased level of suicidal thoughts . For example, the breakdown of a close relationship might increase worries concerning one’s future affective and social life and could put youths who already have suicidal ideation at a high risk for attempting suicide. A better understanding of the relationship between the level of concerns, recent life events and the onset of suicide attempts would help to clarify the relevant factors that should be useful in preventative interventions. However, few studies have been conducted to determine the interplay among these variables. The REPARES project (a French acronym for the “identification and evaluation of concerns among adolescents at risk for suicide attempts”) is a survey that seeks to determine the nature of the stressful life events reported by adolescents recently admitted for attempting suicide at two emergency units in France. Because these surveys were conducted in the days that followed the suicide attempt, the chronological sequence between the stressful life events and the suicide attempt is better established. The primary objectives of this research were to (1) characterize which recent stressful life events are most associated with a higher risk of suicide attempts among adolescents and (2) examine how these recent life events might affect the level of worries among adolescents. All 12- to 18-year-old adolescents who were admitted to the emergency departments at two hospitals in a medium-sized French city for attempting suicide between April 2008 and December 2012 were included in our study. Consistent with Silverman, et al. , suicidal attempts were regarded as “deliberate acts of selfharm with at least some intent to die”. Senior psychiatrists established the initial evaluation. In contrast, youths admitted for self-harm without clearly expressed intent to die were not included. The exclusion criteria were the presence of severe physical/intellectual disability that precludess from the answering the questionnaires. The psychiatrist who performed the initial evaluation provided information to eligible participants and their families. Individual assent and parental consent were required to participate. The control group consisted of middle and high school students. The schools were randomly selected from a list of inner city and suburban educational facilities. The head teachers provided information regarding the voluntary nature of the survey, its objectives, and participant anonymity to the adolescents and their families. The head teachers were asked to report any refusal. An ethics committee approved the investigation, and the respondents provided written informed consent. ii. Life events were investigated using the selfadministered Adolescent Life Change Event Scale (ALCES) . This scale consists of 41 items developed to capture the range of life events that can affect adolescents . It is composed of five domains: family life, school life, social relationships, emotional life and health. For each event, the participants indicated when the life event occurred (i.e., over the last month, over the last year; before the previous year) and whether it was experienced as stressful. iii. Adolescent worries were measured using the State Worry Questionnaire (SWQ) . The SWQ contains 25 items divided into five areas of concern, with five items per domain: interpersonal relationships, lack of confidence, unplanned future, incompetence at work, and financial concerns. Five additional items exploring physical concerns were added to the original scale . The intensity of worry was estimated using a 5-point Likert scale (ranging from 0 = not at all to 4 = extremely). The overall score was the summed score for each item. When administered to young adults, this scale demonstrated excellent internal consistency (Cronbach’s α = 0.90) and satisfactory test-retest fidelity for a one-month interval (r = 0.85). This scale was previously validated in a French sample . The frequencies and distributions of the missing data were examined. All of the participants who completed the questionnaires were included in the analyses. Of the 710 participants in the control group, we omitted those who reported having attempted suicide once (7.3%, n = 52). The analyses were conducted on 658 students. The qualitative variables were analyzed using a chi-square test or Fisher’s test, and the quantitative variables were analyzed using Student’s t-test. The level of significance was set at 0.05. The statistical analyses were conducted using SPSS . The first issue was to determine whether the pattern of life events differed between the adolescents who had been referred for attempting suicide and those who had no history of suicide attempt. We examined which life events were associated with an increased risk of suicide attempt. Successive logistic regressions were performed to measure the associations between each life event and suicide attempt. Odds ratios (ORs) were calculated with 95% confidence intervals (CIs). Because the gender ratio significantly differed between groups, all models were adjusted for gender. No correction was made for multiple comparisons because the tests were designed a priori . To determine whether such life events were independently associated with suicide attempt, a multiple logistic regression was performed. Backward selection was used to identify the explanatory variables. Only variables with a level of significance of > 0.05 were kept in the final model. No interaction terms were added to prevent increasing the chance of type I error, given the high risk for observing significant associations without clinical relevance. The second issue of the paper was to determine whether the life events that were specifically associated with attempting suicide were associated with a higher worry score. We compared the level of worries (the general score and each domain separately) of the youths who experienced one stressful life event with those of the youths who did not experience a stressful life event. Only those life events significantly and independently associated with attempting suicide (as suggested by the above model) were studied. Subsequently, we examined whether the level of worries (the general score and each domain separately) differed between the adolescents who had been referred for attempting suicide and those who were not referred. The differences were examined using t-tests. Third, we sought to determine whether a higher SWQ score was associated with an increased risk of suicide attempt. Logistic regressions were performed to measure the associations between the total SWQ scores and suicide attempts and, subsequently, for each separate subscale of the SWQ. Of the 136 participants who were admitted for attempting suicide, 27 were boys (20%) and 109 were girls (80%). The median ages were 15.7 years for girls (minimum = 12.3 years, maximum = 18.0 years) and 16.1 years for boys (minimum = 12.1 years, maximum =18.0 years). Of the 658 youths without a history of suicide attempt, 295 were boys (45%) and 363 were girls (55%). The median ages were 14.9 years for girls (minimum = 13.0 years, maximum = 18.0 years) and 15.3 years for boys (minimum = 13.8 years, maximum = 18.0 years). The median age did not significantly differ between groups (t = 1.585, p = 0.118). However, the gender ratio was significantly different (χ2 = 31.262, p < 0.001). On average, the youths admitted for attempting suicide reported 1.7 times more life events than those without such a history (M = 15.9 vs. M = 9.6, t(792) = -12.16, p < 0.001). The former group also reported 2.3 times more stressful life events (M = 10.7 vs. M = 4.7, t(792) = -12.22, p < 0.001) and 3.0 times more stressful life events before the last year (M = 8.2 vs. M = 2.7, t(792) = -11.28, p < 0.001). After controlling for gender, the occurrence of an additional stressful life event was associated with an additional risk for suicide attempt (OR = 1.19 [1.15-1.23], p < 0.001). This risk increased if the life event was perceived as stressful (OR = 1.27 [1.22-1.33], p < 0.001) and to a greater degree when this stressful event was experienced within the last year (OR = 1.33 [1.26-1.40], p < 0.001). Table 1 details the frequencies of each life event that occurred any time before the suicide attempt for the two groups. The life events were varied and included all of the domains. The life events most strongly associated with suicide attempt were being expelled from school (OR = 5.77 [3.11-10.72], p < 0.001), running away from home (OR = 3.83 [2.36-6.23], p < 0.001), trouble with the law (OR = 3.34 [1.68- 6.63], p = 0.001), and the death of a close friend (OR = 3.29 [2.06-5.26], p < 0.001). ORs were all adjusted for gender. Significant ORs are noted in bold. Table 1: Comparisons of the Frequencies of Life Events Between Youths Admitted for Attempting Suicide and the Control Group. Logistic regression using backward selection identified the following seven variables that were significantly associated with suicide attempt: parental divorce/separation, school discipline problems, expulsion from school, a romantic break-up, the death of a close friend, hospitalization/one or more medical consultations, and drug use (Figure 1). 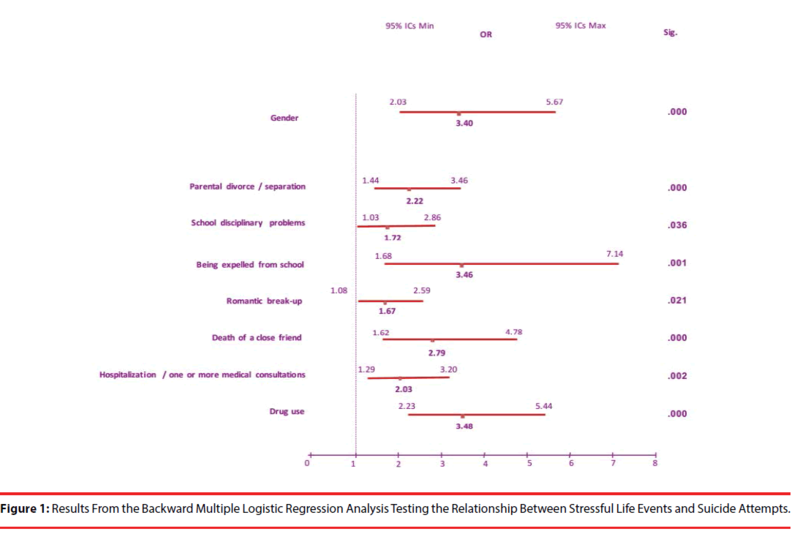 Figure 1: Results From the Backward Multiple Logistic Regression Analysis Testing the Relationship Between Stressful Life Events and Suicide Attempts. In the entire sample, girls presented a higher level of worry than boys on the relationship subscales (t = 1.92, p < 0.001), lack of confidence (t = 1.94, p < 0.001), aimless future (t = 1.27, p < 0.001) and physical concerns (t = 2.32, p < 0.001). The mean score on the work incompetence and financial subscales were comparable between genders. As presented in Table 2, the participants admitted for attempted suicide presented a higher level of worry than those in the control group on 4 of the 5 SWQ domains: relationships, lack of confidence, aimless future, work incompetence, and financial worries. The results remained significant for all of the domains after adjusting for gender (relationships: OR = 1.12 [1.08-1.16]; lack of confidence: OR = 1.12 [1.07-1.16]; aimless future: OR = 1.10 [1.06-1.15]; work incompetence: OR = 1.04 [1.01-1.08]; and financial worries: OR = 1.06 [1.02-1.11]). The mean levels of the physical concern subscale were comparable between both groups. Significant Δ is noted in bold. Table 2: Comparison of the SWQ Scores Between the Groups of Youths Admitted for Attempting Suicide and the Control Group. the Groups of Youths Admitted for Attempting Suicide and the Control Group. Most life events associated with suicide attempts also corresponded with higher SWQ scores (Figure 2). Three life events were associated with higher SWQ scores across all of the domains: the death of a close friend, a romantic breakup, and the use of drugs. Two life events were associated with a higher level of worries on only certain domains. The youths who experienced parental divorce/separation scored higher on the aimless future subscale of the SWQ. Having disciplinary problems at school was associated with higher scores on the aimless future and the financial SWQ subscales. In contrast, the youths who reported having been expelled from school or those who had been hospitalized or had one or more medical consultations did not report a significant change in their level of worries. 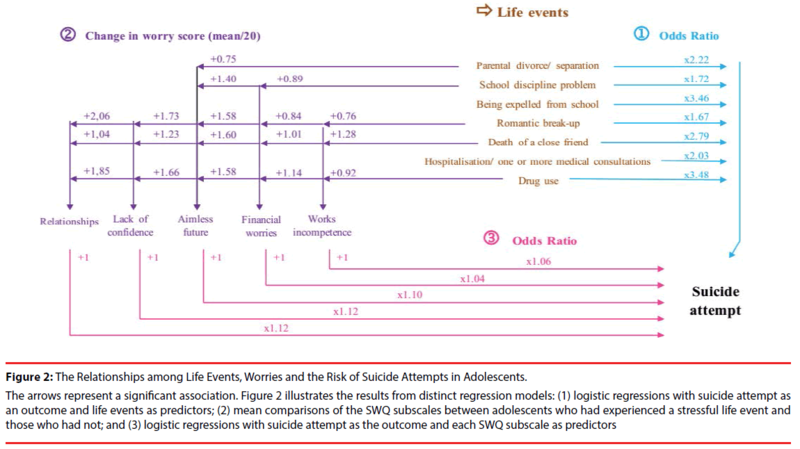 Figure 2: The Relationships among Life Events, Worries and the Risk of Suicide Attempts in Adolescents. In this study, the life events that precede suicide attempts were examined in a sample of adolescents referred to emergency units. The relationship between the onset of recent life events and the level of worries was explored. In keeping with our first hypothesis, we found that adolescents admitted for attempting suicide were more likely to report life events; specifically, they were 1.6 times more likely to report any life event and three times more likely to experience a stressful life event over the last year. Each additional recent stressful life event was associated with an increase of 1.33 in the risk of attempting suicide. These findings are consistent with the results of previous studies. For example, in a New Zealand birth cohort (N = 1,265), Fergusson, et al. found that exposure to stressful life events in adolescents was associated with a higher risk of suicidal ideation and attempts. In addition, the effects of childhood factors such as socioeconomic adversity, marital disruption, poor parent-child attachment and exposure to sexual abuse were largely mediated by mental health problems and exposure to stressful life events during adolescence and early adulthood. Similar results were found in a 22-year follow-up communitybased study in the US (N = 659 families) . The authors found that profound interpersonal difficulties during middle adolescence mediated the association between maladaptive parenting or childhood maltreatment and suicide attempts during late adolescence or early adulthood. These authors advocated for a life course model of suicidal behaviors, in which proximal stressful life events in adolescents play a key role . A closer inspection of our results revealed that three groups of life events were specifically associated with attempted suicide: factors related to family characteristics, the end of an affective relationship, and school- and law-related difficulties. Regarding familial life events, youths admitted for attempting suicide in the present study more frequently reported a change in family composition, parental conflict, parental divorce/ separation, and excessive alcohol consumption in family members than controls. These results are consistent with previous findings in studies conducted in a clinical population [8,9,26] and community-based studies [7,12-14,27-30]. The effect of exposure to familial life events on the increased likelihood of suicide attempts might be primarily mediated by changes in the youth’s familial structure (e.g., divorce or death) . However, the present finding did not support this hypothesis because the life events that affect the family structure without being negative per se (e.g., becoming pregnant or one’s mother becoming pregnant) were not associated with suicide attempts. Alternatively, Consoli, et al. proposed that the relationship between family factors and suicidality is partially mediated by the youth’s perception of the quality of their familial characteristics (e.g., cohesion and support). However, because of the lack of specific measures, we were unable to test this hypothesis. Importantly, the death of one’s father or mother was not associated with suicide attempts in the current study. This result is not consistent with previous reports . This nonsignificant association might be a statistical result caused by a paucity of events that the association with suicide attempts might in fact exist. Romantic break-ups were strongly associated with suicide attempts in this study. This finding is consistent with theories regarding the higher vulnerability that adolescents have with regard to interpersonal difficulties with peers . These findings also confirmed that having a friend with suicidal ideation or previous suicide attempts is associated with a higher risk of suicide attempt [31-33]. Expulsion from school, disciplinary problems at school, and repeating one or more classes were strongly associated with suicide attempts in this sample. The association between suicidality and school difficulties (i.e., repeating a grade or being expelled) has previously been noted in community-based samples [9,12,30] and retrospectively observed in a psychological autopsy . Moreover, in a follow-up study of adolescents hospitalized for a suicide attempt, one protective factor of relapse at 6 months was the Adolescent Coping Scale hard work and achievement subscore . This subscore means that the adolescent is conscientious about work or school, works hard and tries to achieve high standards. This is similar to our findings but is stated as a reverse proposition. We found that trouble with the law was strongly associated with suicide attempts. This finding was consistent with previous studies in which adolescents who are involved in severely deviant or antisocial behaviors were at particularly high risk for suicide attempts compared with others [35,36]. Greening, et al. argued that this link should be especially true in girls. Consistent with our second and third hypotheses, we found that the onset of stressful life events was strongly associated with suicide attempts and affected the level of worries. Moreover, the level of worries was associated with a higher risk for suicide attempt. Therefore, we conclude that interplay exists between recent life events and adolescents’ levels of worry and increases the risk of suicidal behaviors in youths. This study has numerous strengths such as its use of a large sample and the assessment of a broad range of life events using a standardized measure. Moreover, as recommended by several authors (e.g., ), we performed multivariate analyses for testing the relationship between environmental factors and suicidality and better establishing the link observed. Several limitations of this study must be addressed. First, the participants were included after admission to the emergency departments; therefore, it is likely that less severe types of suicide attempts were not examined. In fact, despite national recommendations , only a minority of adolescent suicide attempts are referred to medical professionals . Second, because we collected retrospective self-reported data, a recall bias might exist. Moreover, the context in which the questionnaires were completed differed between groups (i.e., in a well-known classroom vs. an unknown hospital). Third, because cross-sectional data were used, information regarding the direction of the association was unknown. However, the life events likely occurred before the suicide attempts of the youths. Fourth, in this study a school-based sample was used as a control group. The exclusion of adolescents who do not attend school and who are likely to present high level of psychopathology, including worries, represents a possible bias. In this study, the relationships among exposure to life events, worries, and suicide attempts were examined in a population of French adolescents. Despite recent reviews and international guidelines that recommend focusing on proximal environmental risk factors for suicide attempts [37,39], the pattern of stressful life events has not previously been identified in a French sample. Collecting better information regarding which life events are most strongly associated with suicide attempts might motivate healthcare professionals to evaluate and identify certain life events during the initial evaluation. This course of action might also guide the therapeutic strategy for adolescents at high risk for attempting suicide. For example, clinicians might be prone to refer patients to mental health professionals or provide temporary symptomatic treatments for anxiety among adolescents with suicidal ideation when exposed to such events. When a life event is a modifiable factor, efforts should be made to help relatives prevent this life event onset or reduce its duration (e.g., expulsion from school) . We identified five primary reasons why a thorough evaluation of life events is important to clinical practice and the administration of therapy for adolescents with suicidal behaviors. Discussing youths’ recent life events helps to build a more confident climate at the beginning of a clinical interview. As youths begin to perceive a clinician’s interest in their own concerns, they might be less apprehensive to discuss psychological difficulties. Importantly, all of the healthcare professionals involved in a preventative approach is able to manage such a discussion, not only mental health professionals. Discussing how youths cope with a stressful situation helps to explore, in a non-directive way, important psychological dimensions such as attributional style, automatic thoughts, and temperamental features (e.g., impulsivity) or depressive affect as well as determine whether psychological dimensions comprise a specific psychiatric disorder [40,41]. Examining life events can facilitate discussion of the risk of recurrence, which is a key issue in the prevention of youth suicide risk . In particular, this method represents an opportunity to identify the primary source of support (e.g., family members and peers) and the availability of professional resources. It is insufficient to focus only on youths within their home environment . This approach should also encourage patients to identify risk situations and discuss alternative behaviors in response to acute stress and may emphasize protective factors . The fact that adolescents tend to focus more easily on recent events when experiencing psychological distress is important because clinicians might overlook important elements of a youth’s personal history . Adolescence is an age of crisis and rupture ; therefore, it is crucial to enhance self-continuity and consider the youth’s suicide attempt within the context of his or her past . Finally, addressing the relational issues associated with suicide attempts as well as assessing individual and environmental vulnerability factors for suicide attempt is important for clinicians. Discussing the messages that might be conveyed to the patients’ parents and teachers relative to the youth’s behavior should help to promote better communication and avoid attitudes that facilitate the recurrence of attempted suicide . Regarding the implications for future research, the relationship between worries and suicide attempts must be investigated further . In particular, more research is warranted to determine whether the effect of worries on suicide attempts is independent of psychopathology, especially depression severity and/or hopelessness, two strong proximal factors for suicide attempts and relapse [34,47,48]. This study showed that the onset of stressful life events affected the level of worries among adolescents. Similarly, levels of worry were associated with an increased risk of attempting suicide. Therefore, prospective data should help to determine the extent to which the level of worries mediates the relationship between proximal life events and suicide attempts. We wish to thank the school doctors of the Haute Vienne and practitioners in the child and adolescent psychiatry department who administered the questionnaires. We express gratitude to all the children and adolescents for their valuable contribution to this project. Patton GC, Coffey C, Sawyer SM, et al. Global patterns of mortality in young people: a systematic analysis of population health data. Lancet 374(9693), 881-892 (2009). CDC. Injury prevention & control: data & statistics (WISQARS). Centers for Disease Control and Prevention, Atlanta (2011). Insee. Taux de décès par suicide dans l'Union européenne. Insee (2012). Raynaud JP, Olliac B. Suicidal risks in children, teenagers. Rev. Prat 60(8), 1149-1154 (2010). Gould MS, Fisher P, Parides M, et al. Psychosocial risk factors of child and adolescent completed suicide. Arch. Gen. Psychiatry 53(12), 1155-1162 (1996). Gould MS, Shaffer D, Fisher P, et al. Separation/divorce and child and adolescent completed suicide. J. Am. Acad. Child. Adolesc. Psychiatry 37(2), 155-162 (1998). Fergusson DM, Woodward LJ, Horwood LJ. Risk factors and life processes associated with the onset of suicidal behaviour during adolescence and early adulthood. Psychol. Med 30(1), 23-39 (2000). Beautrais AL, Joyce PR, Mulder RT. Risk factors for serious suicide attempts among youths aged 13 through 24 years. J. Am. Acad. Child. Adolesc. Psychiatry 35(9), 1174-1182 (1996). Brent DA, Perper JA, Moritz G, et al. Stressful life events, psychopathology, and adolescent suicide: a case control study. Suicide. Life. Threat. Behav 23(3), 179-187 (1993). Turecki G, Ernst C, Jollant F, et al. The neurodevelopmental origins of suicidal behavior. Trends. Neurosci 35(1), 14-23 (2012). Cooper J, Appleby L, Amos T. Life events preceding suicide by young people. Soc. Psychiatry. Psychiatr. Epidemiol 37(6), 271-275 (2002). Lewis SA, Johnson J, Cohen P, et al. Attempted suicide in youth: its relationship to school achievement, educational goals, and socioeconomic status. J. Abnorm. Child. Psychol 16(4), 459-471 (1988). Johnson JG, Cohen P, Gould MS, et al. Childhood adversities, interpersonal difficulties, and risk for suicide attempts during late adolescence and early adulthood. Arch. Gen. Psychiatry 59(8), 741-749 (2002). Tousignant M, Bastien MF, Hamel S. Suicidal attempts and ideations among adolescents and young adults: the contribution of the father's and mother's care and of parental separation. Soc. Psychiatry. Psychiatr. Epidemiol 28(5), 256-261 (1993). Joiner TE Jr, Brown JS, Wingate LR. The psychology and neurobiology of suicidal behavior. Ann. Rev. Psychol 56(1), 287-314 (2005). Silverman MM, Berman AL, Sanddal ND, et al. Rebuilding the tower of Babel: a revised nomenclature for the study of suicide and suicidal behaviors. Part 2: Suicide-related ideations, communications, and behaviors. Suicide. Life. Threat. Behav 37(3), 264-277 (2007). Le Sphinx. Chavanod: Sphinx Développement (2006). Yeaworth RC, York J, Hussey MA, et al. The development of an adolescent life change event scale. Adolescence 15(57), 91-97 (1980). Windle M. A longitudinal study of stress buffering for adolescent problem behaviors. Dev. Psychol 28(1), 522-530 (1992). Tallis F, Davey GCL, Bond A. The worry domains questionnaire. In: Davey GCL, Tallis F, editors. Worrying: perspectives on theory, assessment and treatment. New York: John Wiley & Sons 285-297 (1994). Dugas MJ, Letarte H, Rhéaume J, et al. Worry and problem solving: evidence of a specific relationship. Cogn. Ther. Res 19(1), 109-120 (1995). Gosselin P, Dugas MJ, Ladouceur R, et al. Evaluation of worry: validation of a French translation of the Penn State Worry Questionnaire. Encephale 27(5), 475-484 (2001). SPSS. SPSS statistics. Chicago, USA (2008). Saville DJ. Multiple comparison procedures: the practical solution. Am. Stat 44(2), 174-180 (1990). Olliac B. Specificity of psycho trauma in children and adolescents. Neuropsychiatr. Enfance. Adolesc 60(1), 307-314 (2012). Beautrais AL. Risk factors for suicide and attempted suicide among young people. Aust. NZ J. Psychiatry 34(3), 420-436 (2000). Schmidtke A, Bille-Brahe U, DeLeo D, et al. Attempted suicide in Europe: rates, trends and sociodemographic characteristics of suicide attempters during the period 1989-1992. Results of the WHO/EURO Multicentre Study on parasuicide. Acta. Psychiatr. Scand 93(5), 327-338 (1996). Wichstrom L. Predictors of adolescent suicide attempts: a nationally representative longitudinal study of Norwegian adolescents. J. Am. Acad. Child. Adolesc. Psychiatry 39(5), 603-610 (2000). Agerbo E, Nordentoft M, Mortensen PB. Familial, psychiatric, and socioeconomic risk factors for suicide in young people: nested case-control study. BMJ 325(1), 74 (2002). Consoli A, Peyre H, Speranza M, et al. Suicidal behaviors in depressed adolescents: role of perceived relationships in the family. Child. Adolesc. Psychiatry. Ment. Health 7(1), 8 (2013). Borowsky IW, Ireland M, Resnick MD. Adolescent suicide attempts: risks and protectors. Pediatrics 107(3), 485-493 (2001). Larsson B, Sund AM. Prevalence, course, incidence, and 1-year prediction of deliberate self-harm and suicide attempts in early Norwegian school adolescents. Suicide. Life. Threat. Behav 38(2), 152-165 (2008). Lewinsohn PM, Rohde P, Seeley JR. Psychosocial risk factors for future adolescent suicide attempts. J. Consult. Clin. Psychol 62(2), 297-305 (1994). Consoli A, Cohen D, Bodeau N, et al. Risk and protective factors for suicidality at 6-Month follow-up in adolescent inpatients who attempted suicide: an exploratory model. Can. J. Psychiatry 60(2), S27-S36 (2015). Bridge JA, Goldstein TR, Brent DA. Adolescent suicide and suicidal behavior. J. Child. Psychol. Psychiatry 47(3-4), 372-394 (2006). Greening L, Stoppelbein L, Luebbe A, et al. Aggression and the risk for suicidal behaviors among children. Suicide. Life. Threat. Behav 40(4), 337-345 (2010). ANAESE. Prise en charge hospitalière des adolescents après une tentative de suicide. Service des recommandations professionnelles. Agence Nationale d'Accréditation et d'Évaluation en Santé (ANAES), Paris (1998). ORS du Limousin. Regards sur la santé des collégiens et lycéens du Limousi. Observatoire Régional de la Santé du Limousin (2008). WHO. World Health Organization: Suicide Prevention (SUPRE). Geneva: World Health Organization (2008). Breton JJ, Labelle R, Berthiaume C, et al. Protective factors against depression and suicidal behaviour in adolescence. Can. J. Psychiatry 60(1), S5-S15 (2015). Mirkovic B, Labelle R, Guile JM, et al. Coping skills among adolescent suicide attempters: results of a multisite study. Can. J. Psychiatry 60(1), S37-S45 (2015). Cameron G, Karabanow J. The nature and effectiveness of program models for adolescents at risk of entering the formal child protection system. Child. Welfare 82(4), 443-474 (2003). Brent DA, McMakin DL, Kennard BD, et al. Protecting adolescents from self-harm: a critical review of intervention studies. J. Am. Acad. Child. Adolesc. Psychiatry 52(12), 1260-1271 (2013). Erikson EH. Identity: youth and crisis. New York: WW Norton & Company (1994). Ball L, Chandler M. Identity formation in suicidal and nonsuicidal youth: the role of self-continuity. Dev. Psychopathol 1(3), 257-275 (1989). Hill RM, Castellanos D, Pettit JW. Suicide-related behaviors and anxiety in children and adolescents: a review. Clin. Psychol. Rev 31(7), 1133-1144 (2011). Brent DA, Greenhill LL, Compton S, et al. The Treatment of Adolescent Suicide Attempters study (TASA): predictors of suicidal events in an open treatment trial. J. Am. Acad. Child. Adolesc. Psychiatry 48(10), 987-996 (2009). Yen S, Weinstock LM, Andover MS, et al. Prospective predictors of adolescent suicidality: 6-month post-hospitalization follow-up. Psychol. Med 43(5), 983-993 (2013).